LandsatLook images are full-resolution files derived from Landsat Level-1 data products. The images are compressed and stretched to create an image optimized for image selection and visual interpretation. Examples of LandsatLook Images, from left to right: Natural Color Image, Thermal Image, and Quality Image. Images are derived from Landsat 8 Path 45 Row 30 acquired April 23, 2013. LandsatLook Images can be downloaded as individual files for each Landsat scene from EarthExplorer, GloVis, or the LandsatLook Viewer. LandsatLook Natural Color Image: a .jpg composite of three bands to show a “natural” looking (false color) image. Reflectance values were calculated from the calibrated scaled digital number (DN) image data. The reflectance values were scaled to a 1-255 range using a gamma stretch with a gamma=2.0. This stretch was designed to emphasize vegetation without clipping the extreme values. LandsatLook Thermal Image: a one-band gray scale .jpg image that displays thermal properties of a Landsat scene. Image brightness temperature values were calculated from the calibrated scaled digital number (DN) image data. An image specific 2 percent clip and a linear stretch to 1-255 were applied to the brightness temperature values. LandsatLook Quality Image: 8-bit files generated from the Landsat Level-1 Quality Band to provide a quick view of the quality of the pixels within the scene to determine if a particular scene would work best for the user's application. This file includes values representing bit-packed combinations of surface, atmosphere, and sensor conditions that can affect the overall usefulness of a given pixel. Color mapping assignments can be seen in the image below. This image displays the Quality Image designations and associated colors for LandsatLook 8-bit images. LandsatLook Images are included as options when downloading Landsat scenes from EarthExplorer, GloVis, or the LandsatLook Viewer. For each Landsat scene, LandsatLook Quality images can be downloaded individually in .jpg format, or as a GeoTIFF (.TIF) when downloading the LandsatLook Images with Geographic Reference file. The LandsatLook Image with Geographic Reference is a .zip file bundle that contains the Natural Color, Thermal, and the 8-bit Quality images in georeferenced GeoTiff (.TIF) file format. It is recommended that these images not be used for scientific analysis. The USGS Global Visualization Viewer (GloVis) is an online search and order tool for selected remote sensing data. 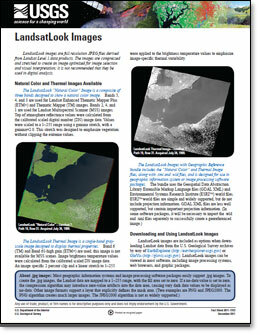 LandsatLook images are full resolution JPEG files derived from Landsat Level 1 data products. The images are compressed and stretched to create an image optimized for image selection and visual interpretation; it is not recommended that they be used in digital analysis.